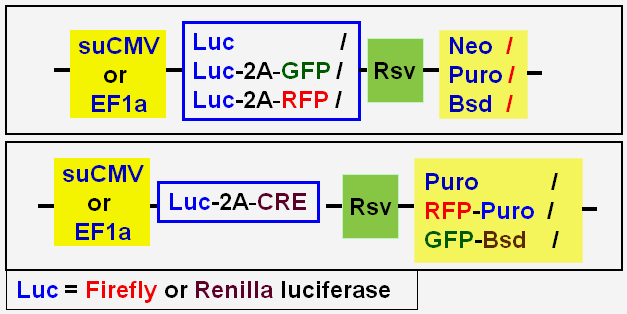 Pre-made stable cell line, derived from different host cell line, constitutively expresses a luciferase enzyme: firefly luc, or Renilla luc with different fluorescent and antibiotic markers. When included, a fluorescent protein (GFP or RFP) or the CRE recombinase is co-expressed under the same super CMV promoter. Different antibiotic markers (or fluorescent-antibiotic fusion markers) were expressed under RSV promoter. See the expression cassette scheme below for details. Please click each product’s link below for product details, or click here to see Product Manual.